Johnny Astro is a surf/lounge band from Seattle, Washington formed in 1997 by guitarist Mark Bombara. We perform and record instrumental surf, lounge, ’60s spy and movie soundtrack music and originals. The band combines the talents of guitarist, song writer and band leader Mark Bombara, drummer/percussionist Shane Peck, vibraphonist Susan Pascal, saxophonist Marty Jourard and bassist Noah Wilson. Mark Bombara is the founder and guitarist of Johnny Astro as well as the guitarist and composer for the pop band Poland. 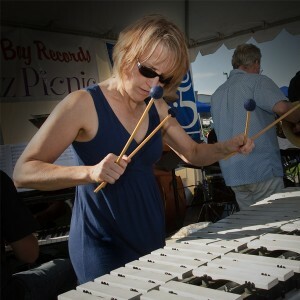 Susan Pascal is a Seattle jazz vibraphonist who has taken her music through four tours of Singapore and concerts, workshops and clinics across the United States. Her Pacific Northwest appearances include the Earshot Jazz Festival and Centrum Jazz Port Townsend, and as a special guest artist with the Seattle Repertory Jazz Orchestra, the Seattle Baroque Orchestra, and Seattle’s Gypsy jazz group, Pearl Django. Susan Pascal leads her own group the Soul Sauce Quintet in a tribute to Latin jazz icon Cal Tjader, and her new Brazil Project band features the rich rhythmic and melodic traditions of Brazil. Her straight-ahead jazz group, the Susan Pascal Quartet has been nominated twice for Best Acoustic Group by Seattle’s Earshot Jazz. Pascal is heard on motion picture soundtracks including “The Wedding Planner”, “Office Space”, ”Eulogy” and “Mirror, Mirror” and is a guest artist on recordings by vocalist Greta Matassa, “All This and Heaven Too,” “And to All a Good Night,” and “The Smiling Hour”; the Vern Sielert’s Dektet recording, “From There to Here”; slide guitarist Orville Johnson’s “Slide and Joy”; and many others. Playing saxophone and percussion with Johnny Astro is Marty Jourard. Marty is most well know as keyboardist and saxophonist for the 80’s pop band The Motels featuring Martha Davis. Marty is the bandleader of the band Novabossa. He has also done a lot of freelance studio work in Los Angeles with Tom Petty and The Heartbreakers, Del Shannon, Bob Welch, Sly Stone, Los Lobos and Martha Davis. Movie soundtrack work on Moscow on the Hudson, Teachers, and Soul Man. Noah Wilson, (AKA Mr. Muffins) is a talented bassist and composer from Seattle. His own group, Mr. and Mrs. Muffins produces beautiful cinematic music and has released 4 vinyl recordings. Noah also performs bass with the bands Laguna and Poland. Shane Peck has played drums and percussion with Johnny Astro since 1998. He also performs and records in the Seattle bands Laguna, Poland, Lushy, 80’s Invasion, The Nines, Gigantor, The Seattleites, Black Celebration (Depeche Mode Tribute), Mr. and Mrs. Muffins and Soular Ensemble Jazz Quartet.